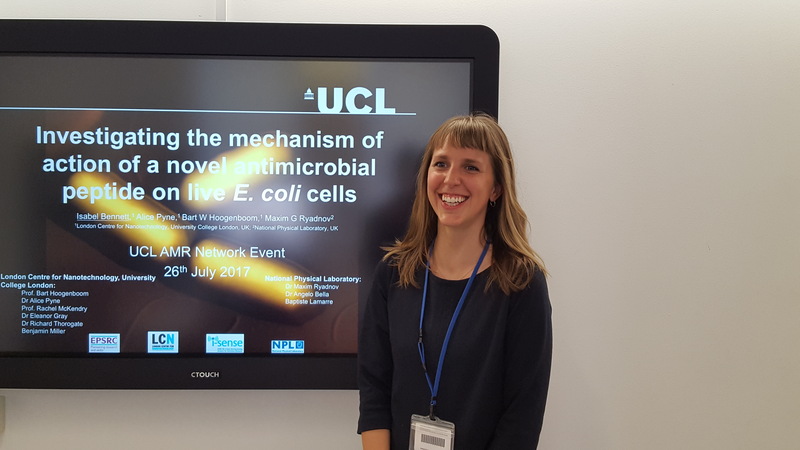 Congratulation to i-sense PhD student, Isabel Bennett, who won the presentation prize at the UCL Antimicrobial Resistance (AMR) Network Event, which took place on 26 July. The UCL AMR Network is a new community that looks to bring researchers from across UCL who are working towards combating AMR. Dr Lena Ciric set up the network to encourage collaboration and to demonstrate the huge amount of work UCL is putting towards the important area of AMR. Ms Bennett says "The networking events provide an invaluable opportunty to meet with others working in the field, as well as the chance for students and early career researchers to present their work in the area. "It was wonderful to hear some of the exraordinary work taking place around AMR at by PhD students and PDRAs at UCL." This particular event hear from Dr Ghada Zoubaine, the Programme Manager for Infections from the Medical Research Council (MRC), who presented at the most recent funding opportunites available for AMR work and encouraged a global view when considering projects. Ms Bennett works with i-sense as part of Professor Rachel McKendry's group in the London Centre for Nanotechnology (LCN) at UCL. She also works with Professor Bart Hoogenboom from the LCN and Dr Max Ryadnov at the National Physical Laboratory (NPL).